Gratitude has no expiration date. Last month, I announced this new carnival, motivated by a thank you note I read that morning. I have been overwhelmed by the quality and variety of posts - some submitted and others I've discovered - during this month. I'm not sure what I expected, but you over-delivered. Thank you. 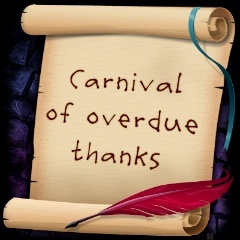 It is an honor to present the first edition of the Carnival of Overdue Thanks. Baila expresses her Gratitude to an entire community, in this beautiful and moving post. Ruti Mizrachi's For Mama, a"h made me weep. It's a Jewish tradition to say "May her memory be for a blessing". Clearly, hers is. Her example is a blessing, too. I forwarded this to many people, including therapists who work with trauma patients. Cynthia Samuels honors her heroic friend Rachel in Triumph Is Expensive saying, "Thanks to my friend whose work made a real dent in danger in the world." Leora remembers a beautiful and enduring act of kindness in Thanks for the Beets. Ilana-Davita thanks Mother in Israel for connecting a number of kids in Ilana's class with a professional baseball player across the world. Ariella presents Thanks (a primer for wedding thank-you-note etiquette or "Thank you note 101" for newlyweds) and her thoughts on written thanks due after receiving a gratuity in Thanks for the tip. Robert's moment of gratitude transformed a brief encounter with a stranger and took my breath away. Adam Berry shares some of the teachings of interdenominational meditation teacher Sri Chinmoy. Adam's post, The unexpected power of gratitude, shows, "The power of gratitude in our daily lives" through the idea that gratitude is something that you become rather than show. Anna Farmery submitted a memory of an outing with her father, and how he built her confidence. Caterina Rando sent in an article where she draws a distinction between compliments and acknowledgement, and recommends adding the latter as a habit in order to attract clients, saying, "Gratitude looks good on everyone. Here are some ideas for upping our acknowledgement where we need it most." 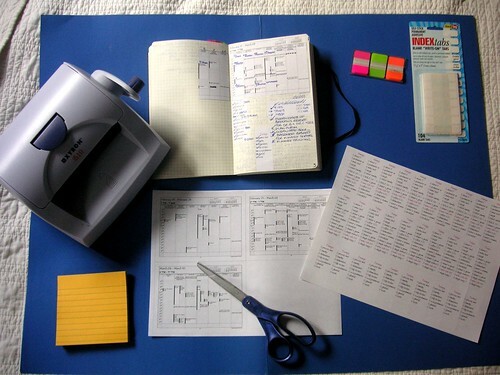 It wasn't submitted, but Seth's Old marketing with new tools, though written for marketers, gives a few pointers for ways to personalize thank-you-notes. Home Life Weekly offers: "I would like to give my free printable thank you cards to the world to spread the word of thanks"
The Carnival of Overdue Thanks is an on-going project, with posts due the Monday before the fourth Thursday of the month, published on the fourth Thursday of the month. For September's edition, the post submission deadline is Monday, September 22, 2008, to be published on Thursday, September 25, 2008. For this carnival's submission guidelines, please see the bottom of this page. 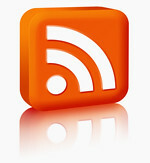 Please submit your blog article to the next edition of the Carnival Overdue Thanks using our carnival submission form. by Juggling Frogs at 10:08 PM 13 comments, so far. Add yours now! DovBear asked a few suckers victims fellow bloggers to fill the gaping void while he's on vacation for a couple of weeks. UPDATE: Here's my second guest post, "Not such a happy Labor Day for Agriprocessors"
by Juggling Frogs at 9:52 AM 5 comments, so far. Add yours now! by Juggling Frogs at 1:13 PM 7 comments, so far. Add yours now! Have you ever noticed, when someone starts a conversation with "I must be the worst parent ever, because..." what usually follows is great parenting practice? "I must be the worst mommy in the world because I fed them macaroni and cheese from a box last night." This, from a mother of many, who creates elaborate Shabbat meals every week, is only two loads away from an empty laundry basket, and has chaperoned nearly every field trip in countless years of her kids' lives at school. Oh, and they were home late that night because of an unscheduled doctor's appointment. Yeah, she should have made them all wait for salad full of cruciferous vegetables glistening with antioxidants, cut on the diagonal. "They're going to hate me because I wouldn't let them go to both birthday parties on the same day. It was all just too much for me. " News flash: All parties are optional, with perhaps the exception of one's own. It's okay, in fact, it's good, to model moderation in one's social life. Any host who doesn't understand this, is worth seeing less, anyway. "I'm such a bad mother. I ducked a play-date because I can't stand the other kid's mother. I'm going to ruin his social life." Or, she's going to refrain from ruining her own. This is a complicated situation, but it's not bad parenting to respect her own boundaries. "I'm the worst mother ever. I told him he had to walk home from soccer practice. I've only been to half the games because his sister's piano lesson is at the same time, across town. I told him I can't be everywhere. He told me the other mothers are always there." I don't believe him. And even if he's right, and all the other mothers are there, so what? I mourn for the time when kids could play games without adult interference. In the U.S., kids are so supervised, scheduled, monitored and chaperoned that it's rare that they get the opportunity to referee themselves and organize their own games. It's enough that we know where they are, and that they're safe. Why can't they have some experiences without an authority figure structuring and framing them? Not every kid-initiated activity degenerates into the Lord of the Flies. It's also important for the child to know that his mother is human, and has limits. All of these decisions could have gone another way, and still have had reasonable results. It might have been better (or not significantly worse) to have used whole wheat pasta, carpooled to the parties, arranged a group play-date that minimized contact with the odious parent's lovely child, or developed a relativity-defying transporter that allows a parent to attend multiple simultaneous events. I don't know. Neither did they. When a thoughtful, invested and intelligent person wields decision making power, inevitably there will be mistakes. 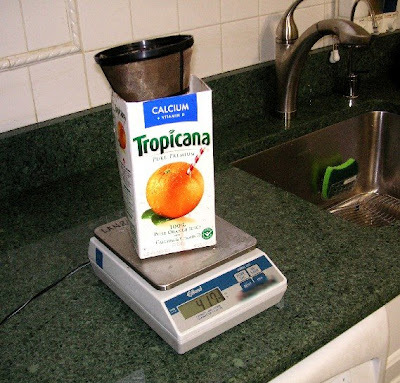 It's important to be open to evaluating the result and cost of our judgments. When we become parents, we switch teams. We become 'them'. I think these "worst mother ever" stories originate from a holy empathy born of our previous affiliation. We put on the Parent Hat, make the decision, then remember what it felt like to wear the Kid Cap. When we hold our ground, while respecting change the color of our team jerseys. The Worst Evers understand good sportsmanship. Seeking feedback from choices requires depth and courage. If droplets of remorse are allowed to accumulate, it's possible to drown them, given the staggering quantity of small choices in a typical parenting day. These Worst Mom Evar stories serve an important purpose. They help us drain each other's buckets. Meanwhile, don't get me started on those who proudly tout their systems, clearly convinced they've outsmarted childhood. It's whenever I think (however briefly) I've "solved parenting" that the Universe promptly delivers a whack upside my head - like banging on a radio to get better humility reception. I'm not saying there's no place for a positive evaluation of a great result, or that satisfaction is impossible. I'm not advocating neuroticism. It's just that complacency and smugness are incompatible with the authenticity and flexibility required for any important relationship. So, give me the parents willing to consider their imperfections, those with active feedback-reception-loops who test their results and their measurement scales. Give me those capable of introspection, adaptation, and a sense of humor. Go on, give me your worst. They're the best. Mazal tov to MamaBlogga on her new baby! This post was written in response to her "New Normal" themed group writing project. Oh, and speaking of guilt and parenting decisions, Catherine presented this wrenching story today at her blog (coincidentally named "Her Bad Mother"). by Juggling Frogs at 9:21 AM 18 comments, so far. Add yours now! One of the fundamental principles of "Getting Things Done" is to establish and rely upon a "trusted system" to free brain cells for thinking, rather than remembering. Today I learned how this good advice can be taken a bit too far. I have a magpie-like tendency to collect casually-mentioned social information in my calendar in the form of dated but untimed notes. If a friend mentions that they're expecting a baby next October, I might put a note on October 1st with "So-and-so's baby due". When a cousin mentions the closing date on his new house, I scribble or enter it in the notes for that day. Life gets busy, and it's hard enough to keep track of my own comings and goings, never mind those of the people I care about. So these little reminders help me remember others' important milestones, without taking up too much of my limited and taxed bandwidth. This system has saved me from making awkward and inappropriate comments on more than one occasion. Sometimes I get to masquerade as a more thoughtful and caring person than I really am. Other times, this technique counterbalances an absentmindedness that could otherwise be mistaken for a lack of interest. But, like any system, it is merely a tool. One can't rely on auto-pilot for take-off and landing. Two years ago, a friend mentioned the date of her son's bar mitzvah in passing, and I quietly blocked off that weekend in my calendar. I wanted to be sure to be available to help. For her older children, I helped design, print, and stuff the invitations, hosted overnight guests, and was involved with much of the general schlepping and fretting associated with running the events. I had every expectation to be similarly involved with her son's bar mitzvah. So, as you can imagine, I was surprised and disappointed last week, when I went to book something for two weeks from now and saw it conflicted with the time I had blocked off. The last time I spoke with my friend was the beginning of the Summer. I didn't give it much thought, because all of her children go to sleep-away camp, and she has a demanding career. 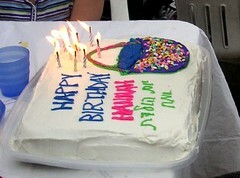 But, here was the reminder of this major family milestone, and she hadn't mentioned word one about the upcoming events. Clearly, I was not consulted because our family wasn't invited. I started to agitate about this. Did I do something wrong? Did I offend her or her family in some way? Was I supposed to have done something that I forgot about? No. She must have had some need to cut off the guest list at a much smaller number than last time. Or maybe she did invite us, and I misplaced the invitation. Maybe she didn't consult with me because she didn't really like the invitations last time, and she didn't want to be insulting. Or maybe it got lost in the mail. Maybe she's annoyed with me for not responding to this invitation I don't remember receiving. She could be sitting at home, right now, aggravated because she never received a response from me. Should I call her and ask how the plans are going? No. If she didn't call to discuss the plans, maybe she's hoping that I won't remember them. Bringing it up would embarrass her. Or me. Should I call her, just to chat, and see if she mentions it on her own? No. There isn't any precedent for phone chatting in our relationship, and she's probably really busy with the preparations. This would be the last thing she needs. Besides, it might seem like a hint for an invite, which would be awkward and annoying for both of us. Maybe I should just buy the gift and send it now. But that's also easily interpreted as hint-like. What if I send the gift now, and get the invitation next week? Then it will clearly have been an afterthought to have invited us, and we shouldn't attend. If she invited us out of a feeling of obligation or guilt, our company would bring no pleasure and just increase her catering bill. If we're not invited, do we send the same size gift as if we were? Is that very question fair, reasonable, or petty? I could call our close mutual friend, and ask if she's helping. No. That's not fair, putting her in the middle of things. I was hurt. And I was annoyed with myself for feeling hurt. There are so many factors in compiling a guest list, not the least of which is the cost of the event. Nobody's budget is infinite. The list has to be cut somewhere. How dare I presume that I'd be invited. This morning, I just couldn't stand it any more. I had to make a decision about scheduling something else on that date, and decided it was ridiculous to keep it blocked off just in case we were invited last-minute. I saw it, just as I was contriving a pretext for the call while looking up her phone number. 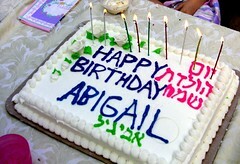 In the notes next to her phone number was the date of her son's bar mitzvah. In 2009. Next year. I let my system steer me off a cliff, despite all the contrary evidence of our many years of friendship. Maybe I'll show her this post. I don't know. I'm a bit embarrassed about the whole thing. But for sure, I've learned a lesson about not putting more trust in a system than in a valued relationship. by Juggling Frogs at 1:29 PM 14 comments, so far. Add yours now! Okay, I've had it. It's too hard to find everyone's user-id on Twitter. So I'm asking for your help. I'm going to turn this post into a list of Twitter users, their names (or aliases), and a link to their blog or website (if applicable). If you'd like to be included, please comment on this post, and I'll do my best to keep the list updated. Rule one: No expectations that anyone will follow anyone or attempt to keep up. There is no expectation that you'll add me or anyone else to your follow list. This is just a list for cross-referencing bloggers with twitter user-ids, not a ketubah (marriage contract). The beauty of Twitter, as far as I can see it, is that the messages are short and temporary. It's not e-mail, it's not a commitment. Some people follow lots of people; some almost none. People are followed for a bit, dropped, added back again, etc. with no hard feelings. Rule two: While I reserve the right not to link to offensive, pornographic, hateful, or purely SPAM blogs, at my sole discretion, this list isn't my endorsement of any of the blogs or twitterers, or any of the content they contain. If you want to be removed from this list, please send me a private e-mail. Rule four: Some of the twitter users on this list may have set their updates to "protected" status. If you want to communicate with them, that is between the two of you. by Juggling Frogs at 9:05 PM 25 comments, so far. Add yours now! I've started twittering. I'm not exactly sure why, or for how long, but I'm giving it a try. 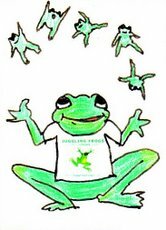 For those who'd like to follow me on twitter, my username is jugglingfrogs. I've agreed to try this as an experiment, but plan to quit if/when it becomes burdensome or addictive. Okay? UPDATE: Anyone looking for more Twitter resources should read Jaffer's excellent comment below. It's full of links and resources. Thank you so much, Jaffer! by Juggling Frogs at 9:23 PM 11 comments, so far. Add yours now! Today is the Jewish holiday of Tisha B'Av. It is a fast day, traditionally spent studying the kinnot. NOTE: When Rabbi Schacter refers to source page numbers, he means the handwritten numbers (not circled) at the bottom of the pages of the complete packet. These don't always line up with the pdf document's page numbers. When he refers to two larger page numbers in pairs, it's to those following the kinnot in either of two different books of the kinnot. For those observing Tisha B'Av: Have an easy and meaningful fast. May this year be our last. Update: This is the book Rabbi Schacter edited and quoted, of the Rav's reflections on the Tisha BAv Kinnot. I have it. It's excellent. by Juggling Frogs at 9:05 AM 3 comments, so far. Add yours now! Don't worry. I'm not about to start revealing unpleasant personal medical information. I've started vermicomposting. It's usually at this point, after I explain that I've voluntarily brought thousands of worms into my kitchen, that people start to back away, slowly, surreptitiously seeking the most direct path to the nearest exit. 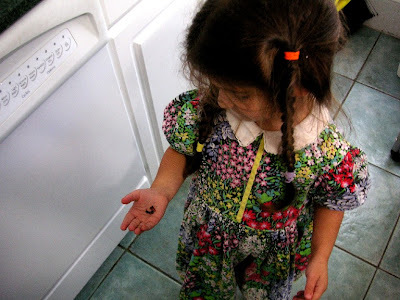 You see, it's a bit of a stretch for a Jewish housewife to bring worms *into* the kitchen. Jewish dietary laws forbid ingesting worms, and the kosher cook is required to spend significant energy obsessing about inspecting produce for worms (and other bugs). So I'd like to make it clear: We don't put the worms in our food. We put our food into the worms. Adventures in Vermicomposting: Tales of the wet and squiggly. It was a short but wiggly path to worm ownership. I'd read about it for a while and was intrigued by the idea of odorless composting indoors in the Winter; tantalized by the prospect of goof-proof fertilizer. 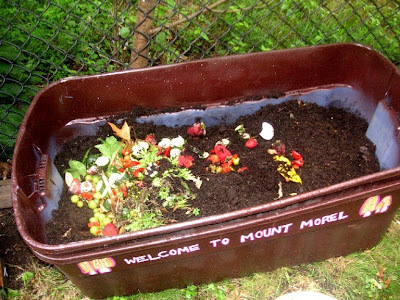 Worm castings make excellent fertilizer that doesn't burn plants. 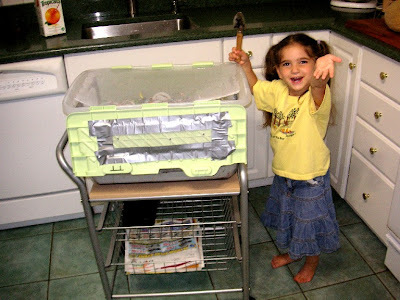 The "worm box" can be made almost arbitrarily small, and kept in the kitchen, basement, or an outdoor container (insulated when exposed to frost, and heated in extreme temperatures). The only thing holding me back from full worm custodianship was that I was too cheap reticent to pay for the earthworms. I mean, after all, we have a yard. We have a lazy and neglected compost pile. After every rainfall, earthworms sun themselves in our driveway. Pay for earthworms? You've got to be kidding! Or so I thought. One day, about a month ago, as I sat at my computer, casually Googling "homemade vermiculture systems", I decided to start first, and figure out the particulars along the way. From my desk, I called out to my son, who had the misfortune of being home at the time, "Jonathan! JONATHAN!!" "No." A sudden wariness curled the edges of his voice. After a beat, slowly and carefully, he offered, "I could put them on." "Good. Please put on yucky shoes and go collect a bunch of earthworms from the yard." "You know, earthworms. I think 100 will be enough to start." "Exactly! That's the best time to collect them. They come out in the rain." "What do you mean, 'no way'?! I'm your mother, and I want earthworms. Go get me some." "Didn't you hear me? I really mean it. I want you to dig up a bunch of earthworms for me. The sooner you get started, the sooner we can begin. I have a really cool project to do, and this is part of it." "Look Mommy, it's not going to happen. I'm not going to go - out in the rain - get all wet and dirty - to dig up some disgusting worms. And I want nothing to do with any project that requires worms, or getting wet, or anything like that. " "Look, Jonathan. You are my son, and I am your mother. The whole point of having a son, is that when you want earthworms, it's his job to go and dig them up. This is your job. " "Nope. Not going to happen." "Jonathan! The mother doesn't get her own earthworms. That's just not right. Please. Go. Get. Me. Some. Worms." "Sorry. You're on your own." And with that, he retreated, barefoot and dry, to his room to do something useless and boring like study for a chemistry test. Channeling The Little Red Hen and muttering under my breath something about "ben sorer u'moreh"*, I donned a pair of rubber gloves and set out to dig up a starter colony of earthworms. Finding and capturing the worms was more difficult than I expected. Our compost pile is mostly yard waste, piled high and left unturned for the eight years we've owned the house. The result is a cylinder of fantastic soil, ten feet in diameter, piled higher than me, without odors or pests. It has tons of earthworms and what I now recognized (thanks to the Internet) as worm cocoons. The problem was, more often than not, they squiggled away from my wet grasp. The rain helped uncover them, but it also helped them escape. Four hours later, drenched to the core and covered in mud, I declared victory and left the battlefield with my bounty: a mason jar of about fifty worms. "Discretion is the better part of valor", after all. 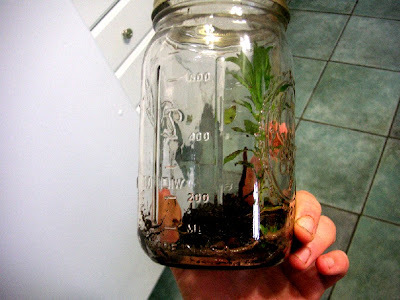 Jar of earthworms from our garden. There are about 50 worms inside. I tried not to dwell on how much better my son would have been at this than I was. I would have mentioned it to him, but he was hiding in his room. The coward. I made a mesh lid for the jar using of a bit of window screen and set it, covered with a towel, on the kitchen counter. (I had read they prefer the dark.) Peeling off wet clothes , I considered burning my sneakers, then went to wash up and figure out what to do next. 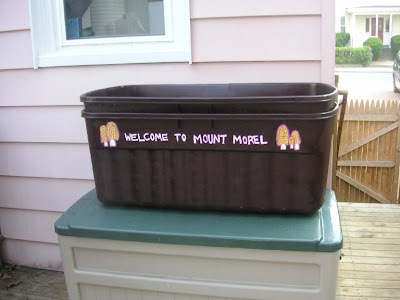 Searching on-line for worm box instructions, I learned I had collected the wrong sort. The kind I had, the regular garden earthworm, is great for plants. Its castings make fine soil. But they are not appropriate for indoor vermiculture because they burrow and don't do well indoors in containers. 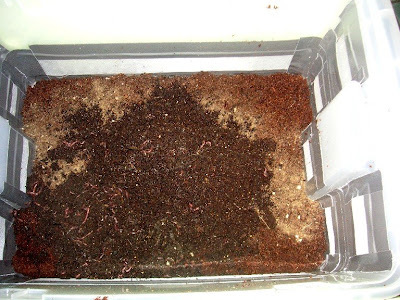 The type of earthworm most suitable for indoor composting is the Red Wiggler. 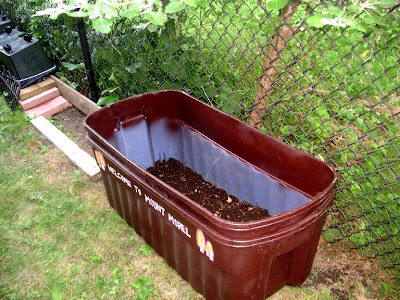 It's a top-feeder, making the compost easy to harvest. It's also a very hungry worm, processing half its body weight every day. So, two pounds of red wigglers eat seven pounds of kitchen scraps a week. A half gallon of kitchen scraps (peelings, coffee grinds, eggshells, etc.) weighs about 2.5 pounds. Also, Red Wiggler worms tend to be quite happy in containers and seldom escape. After reluctantly releasing my worms in our strawberry patch, I headed off to find a reasonable source of Red Wigglers. The pet store was less than helpful. I spent a bit of time looking for a bait shop, but it was getting late. 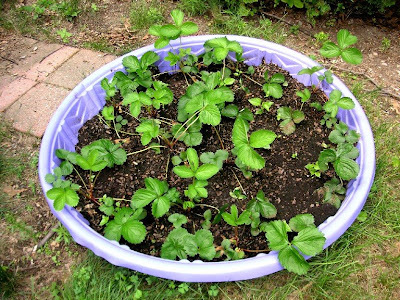 Our strawberry "patch" lives in an old plastic pool. It was cracked and couldn't hold water any longer, making it perfect for a well-drained planter. So. Off I went to Wal-Mart. The nearest one was 20 miles away. I got there, just as the doors were closing, and ran to the back of the store. I found the small glass-fronted refrigerator in the fishing section. It was almost empty, save for three small plastic pints of worms. Unfortunately, they were Night Crawlers. Not Red Wigglers. No amount of reading and rereading the containers changed their names. I left empty handed. The clerk had to unlock the door to let me out of the store. During the half-hour drive home, I realized that I'd spent half a day and eight dollars' worth of gas and still remained wormless. It was time to cut my losses and order the stupid worms on-line. Before midnight, I placed an on-line order with the Worm Ladies of Charleston**, and fell asleep. The next morning, it seemed a good idea to clean out my refrigerator in order to begin collecting kitchen scraps to feed to the worms when they arrived. This way, the scraps could begin to rot a bit in advance preparation for our guests. The worms eat the rot on the fruit or vegetable, not the fruit or vegetable itself. I wanted to get a head start so I could start feeding them as soon as possible after I got them. Looking into my refrigerator, I noticed just how much of its contents were not food. There were the bundled asparagus roots I ordered before learning they wouldn't do well in a container. They were waiting for me to locate and dig out a sunny 20-foot plot to plant them. There was the bottle of kosher vegetable rennet, awaiting a cheese-making experiment, based on a blog post at Kosherblog. There was a chilled aluminium rolling pin, a container of home-made play dough, and a trivet covered in candle wax that was put there to make it easier to clean. And there, all the way in the back, was a plastic bag filled with mushroom spores. I had forgotten all about the mushroom spores. They came with the mushroom growing kit I bought a couple of months ago. 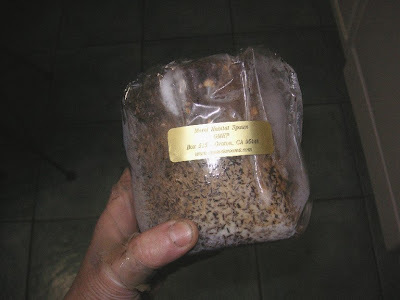 The kit came with four varieties of mushroom spores: three logs that could be grown indoors (Shiitake, Oyster, and Pom Pom Blanc) and one (Morel) that required its own dedicated outdoor compost heap. 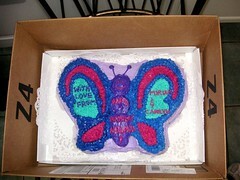 The instructions said the Morel spores can be kept refrigerated until their habitat is established and ready for them. These are the mushroom spores, from the back of my refrigerator. It seemed a good day to deal with the mushroom spores. Part of why I had procrastinated about setting up the Morel Mushroom Habitat was that I was a bit spooked from reading about the horrible deaths experienced by those poisoned by eating False Morels. While the kit guarantees the safe, good, real kind of Morels, I am still a bit squeamish at the prospect of eating unbounded mushrooms popping up in unpredictable locations. I've never had a Morel mushroom, but those I've asked who have had them, say that they really are "all that". Figuring "if not now, when? 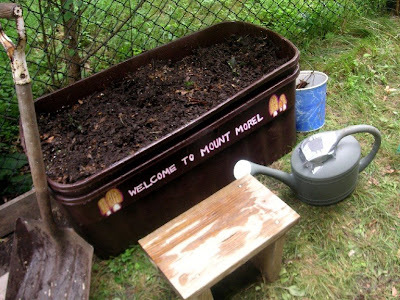 ", I set up a large container, dubbed it "Mount Morel", and filled it with the best soil from the compost heap. And, what does a compost heap need? Earthworms, of course! And that is how, I came to spend another half day, digging up earthworms. Fourteen hours after I let their cousins free in the strawberry patch, I spent the morning under the greedy eyes of the flock of doves*** that live in our yard, harvesting the pile for worms to populate Mount Morel. 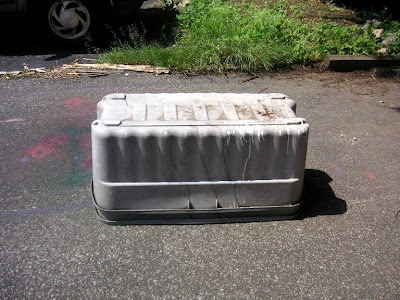 This is the very large old plastic container I used to house the Morel Mushroom Habitat. This is the same box, after cleaning it and painting it. 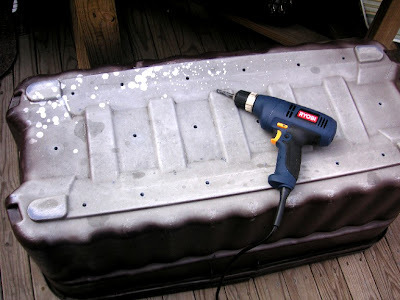 When the paint was dry, I drilled a bunch of holes in the bottom for drainage. Mount Morel, near our back fence. The surface is about 9 square feet of soil. I put about 8" of rich compost in the bottom of the container, then crumbled the mushroom spores on top, mixing them in about 4" deep. Then I covered it with another 4" of soil. Kitchen scraps (peelings, egg shells, coffee grounds, but no animal products or fats) leaves from indoor plants, and weeds from the garden got turned into the top layer and covered up with more soil. Every few days, I turn under more of the same materials. My worm delivery arrived a couple of days later. So, I'm now the happy guardian of two sets of worm colonies. We have a discreet box of happy and productive Red Wigglers in the kitchen, and another population thriving in the protected shady backyard enclave of Mount Morel. The box from the Worm Ladies is meant to be used as is. It comes with a bunch of holes already drilled in it. But, I wanted to add a few more to keep the system well aired out. The reason garbage cans smell bad, is that they are closed up, and work anerobically (without oxygen). I made more air holes to help keep the box from smelling bad. 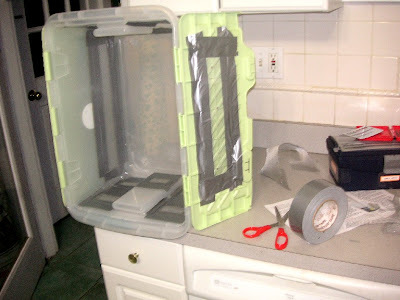 Then, (maybe a bit paranoid, but it made me feel better to do this) I duct-taped bits of window screen to the inside of the box, over every air hole. Call it the Wormy Hotel California: They can check out any time they like, but they can never leave. The kit I bought from The Worm Ladies came with "coir", which is shredded coconut. 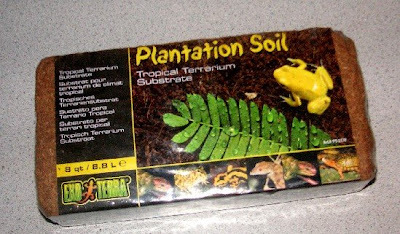 It makes an excellent bedding material for the vermiculture system. It retains moisture very well. The coir arrived in a compressed brick form. To set it up, I soaked it in water, strained it, and put it damp (but not leaking wet) in the bottom of the prepared worm container. 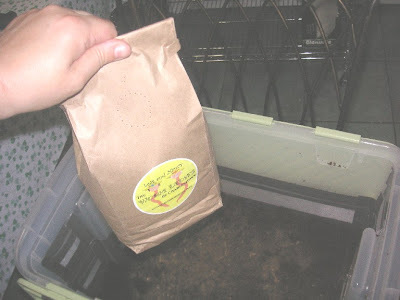 Two pounds of worms were shipped in a lunch-sized wax-lined paper bag. They were a mixture of tiny baby white ones and mature adult red worms. 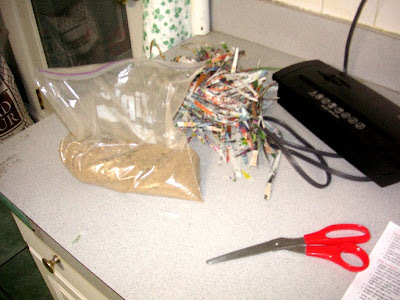 I added a handful of beach sand (for grit) and shredded newspaper and junk mail (for bedding and humidity control.) The worms don't have teeth, so they need a bit of grit to aid their digestion. The worms took to their new home very well, immediately burrowing under the bedding. 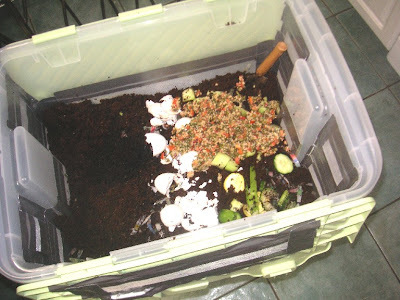 Kitchen scraps are placed on top of the worms and bedding, then covered with more bedding. 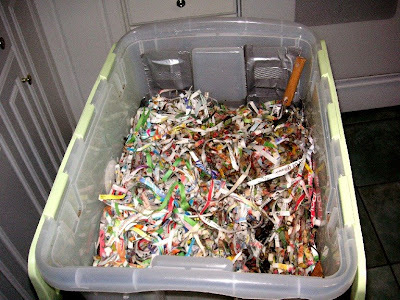 A bunch of shredded newspaper as the top layer, helps stabilize the humidity in the box and prevents flies from landing on the food scraps. 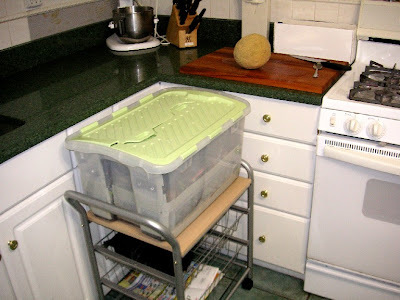 Our worm box sits on a cart, so it can be wheeled up to the counter to receive scraps. "Worms eat garbage. They make dirt. They don't have teeth, so they don't bite you. You have to hold them carefully or they will get squished. They poop and the poop makes the plants grow a lot. Some people think they're yucky or scary but we like them." This was a lot of fun, and we've been at it for a month now. But, if I ever have to dig up another worm again, it will be too soon. ** After some shopping around on-line, I chose them because they were nearby, reasonably priced, and enthusiastic. Plus I liked their story and their style. *** I had to cover the box with chicken wire to keep the birds from eating all the worms in the box. I felt like Elmer Fudd, shaking my fist in the air at them, calling out "Stupid birds! Go get your own worms. These are MINE." by Juggling Frogs at 2:53 PM 18 comments, so far. Add yours now!